Cant see us coming away with any points from this. If we get a draw I'll be happy. Thoughts? I expect a draw from this.... Wolves are flying high yet i think we can play our style and get a draw. Who knows maybe Almiron will come on from the bench when legs get heavy and carve out a winner..... Here's hoping. Playing well overall. 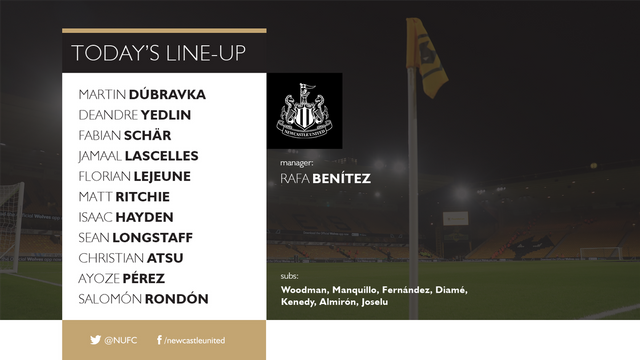 Yedlin looks like an accident waiting to happen though, he is back playing like the old Yedlin who can't defend to save his life. Schar has looked shaky at times as well, but mainly on the ball rather than off it. Dubravka has made a couple of decent saves which I am pleased about following the Spurs game. I'd say so far so good, Rondon looks dangerous on the break, more of the same second half and we could end up taking a valuable point here, or even 3 if we can take one of the chances which will no doubt fall our way at some stage. Dubravka again. Hope he's not going to make a habit of this. Dubravka, what the feck, seriously what the feck. Not because the ref seemed to be "playing until Wolves score"
More the way we kept giving the ball away too easily when we should have been keeping it and knocking it around. Bit worried about Dubravka making another mistake and wonder what affect it will have on his confidence. He made some good saves in that game, but people will only remember the mistake. Never mind, I think lots of fans would have taken a point before the game. To conceded in that manner at that stage in the game feels like worse than a loss. I am absolutely gutted, can't believe it. I didn't have the luxury of watching it as i was at work in scumderland .... those mackems cheered when wolves equalised .... hate it when the radio has the match on and those twats gloat. Anyway how did Almiron do when he came on ?